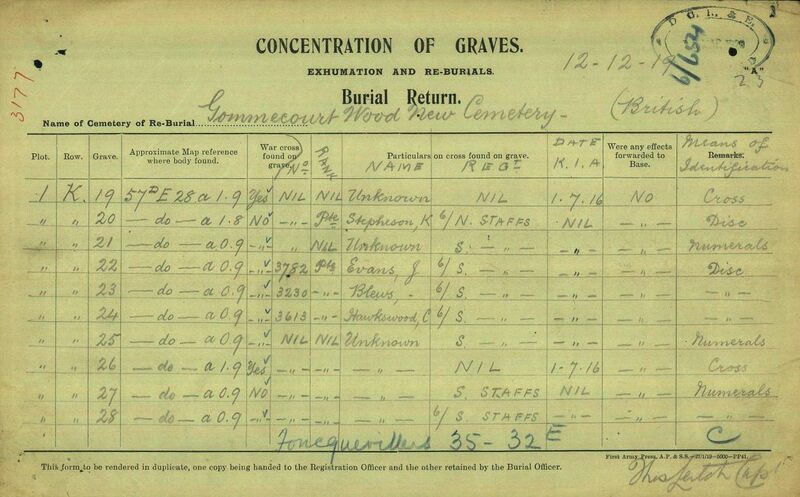 The Commonwealth War Graves Commission has recently made available digital copies of the Burial Returns (Concentration of Graves – exhumation and re-burials); an example of which is shown below. These re-burials were performed by the 200th Labour Company, who were based at Bucquoy, and occurred between November 1918 and March 1920. The Officer Charge appears to be Captain Leitch and they formed part of the 25th Grave Registration Unit in Area number 1 (see below). Thirty six pages of Burial Returns are available via the CWGC website and detail the re-burial of 378 men of the 46th North Midland Division. However, this probably only represents a proportion of the total record since the CWGC site only provides those record sheets in which a at least 1 named soldier is listed. Nevertheless, these records are still very valuable for assembling a picture of where men of the 46th Division were buried prior to the opening of Gommecourt Wood New Cemetery a year after the Armistice. The map above shows the location of 41 different burial sites (white boxes) identified between November 1919 and March 1920. The number of men found at each site varies between 1 and 80. 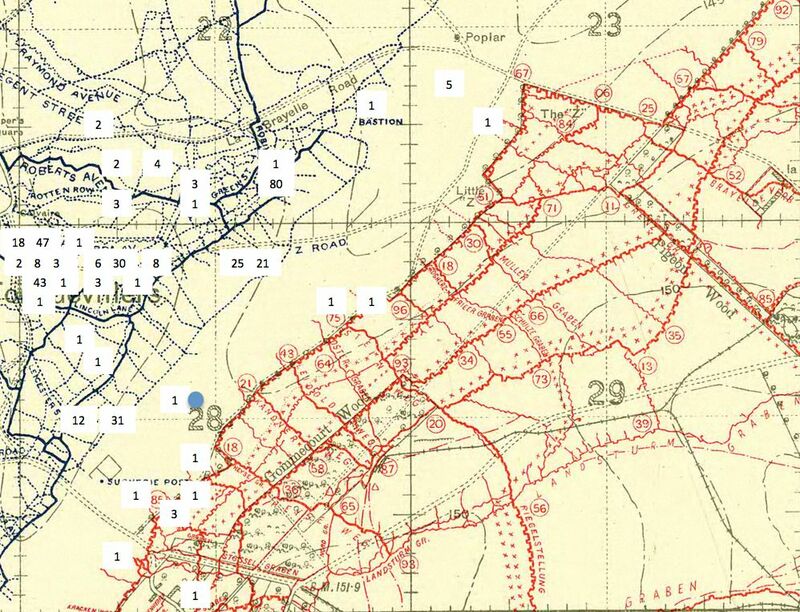 The blue circle represents the reported burial site (28.A.90.10) of 5 Officers and 68 other ranks buried by the 1/6th North Staffs on the 20th March 1917 (below). There is a a large concentration of graves in square 28.A. located between STAFFORD AVENUE and LINCOLN LANE. 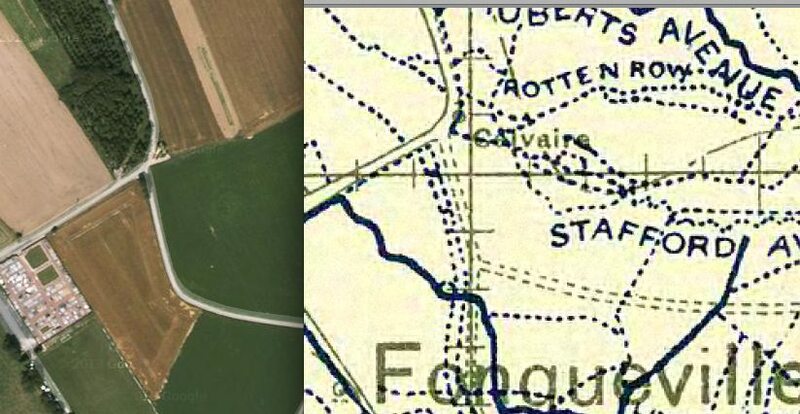 This area is immediately behind the front line trenches occupied by the 138th Brigade and may represent casualties removed from the British front line to the 1/1st and 1/2nd North Midland Field Ambulances that were based in Foncquevillers on 1st July. The grouping of two small cemeteries at 28.A.3.0. (12 men) and 28.A.5.0. (31 men) are likely to be men recovered from non-mans-land in 1917. 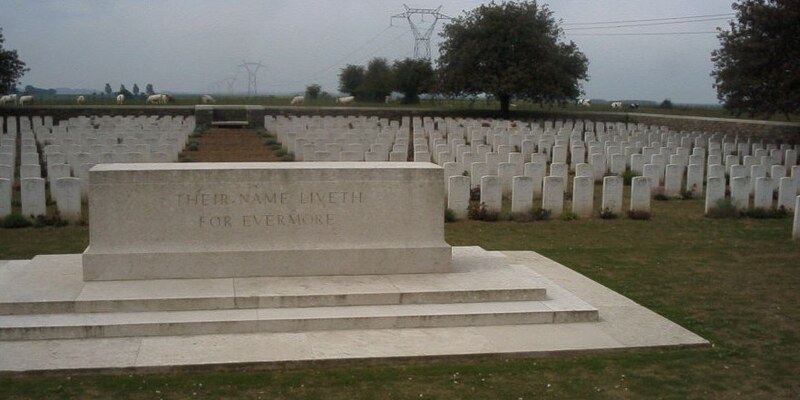 This cemetery may be Gommecourt Wood No 1 – The Sap. The two small cemeteries at 28.B.1.8. (25 men) and 28.B.2.8. 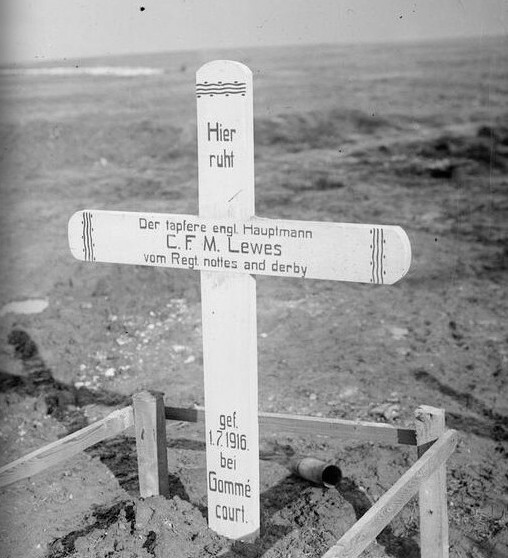 (21 men) are probably the remains of GOMMECOURT WOOD CEMETERY No. 8. The large concentration of 80 graves at 22.D.3.2., which was close to the junction of GREEN and ROBINSON STREETS, are primarily those of men from the Notts & Derby Brigade. In particular the 5th and 7th Battalions. The re-burial site recorded at 28.A.90.10 by the 1/6th North Staffs is clearly incorrect. However, the bodies of 3 Officers were recovered from 28.A.5.0. suggesting that this was the actual site of the reburial. It is tempting to suggest that isolated graves within or close to the German front line are the original burial sites of these men and they were not moved to the mass graves in 1917. The surviving records for several of the men re-buried by the 200th Labour Company confirm that their initial burial occurred during 1917 and that their bodies were exhumed and re-interned in 1919-20. Plot 57. D. E. 28. A .1. 9. 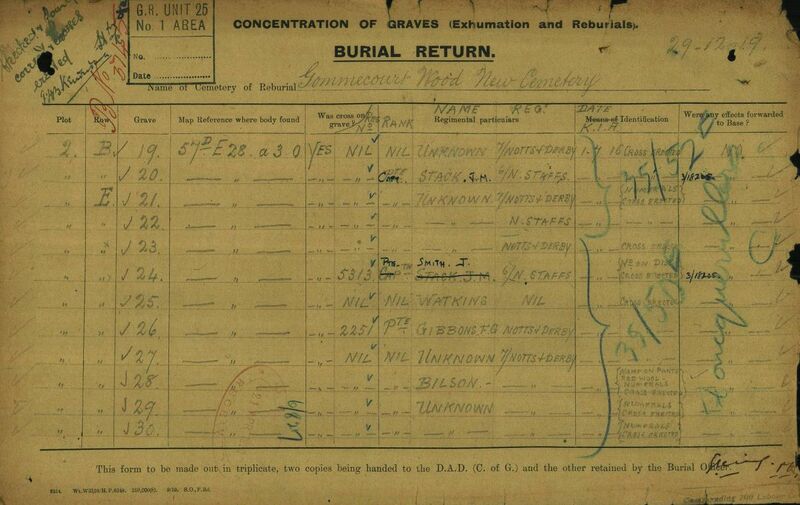 Sheet “15” of the Burial Return Registry for Gommecourt Wood New Cemetery dated 2nd December 1919. The men are recorded as being buried in Plot 2, Row G, Graves 4 to 13. Their bodies were recovered from either 28.A.1.9. (6) or 28.A.5.8. (4) and of the 10 bodies recovered; 5 are unknown. All of the unknown men were recovered from unmarked graves, however, for 4 of these men their shoulder titles identified them as members of the Notts & Derby Regiment. Interestingly, although 2291 Sergt. 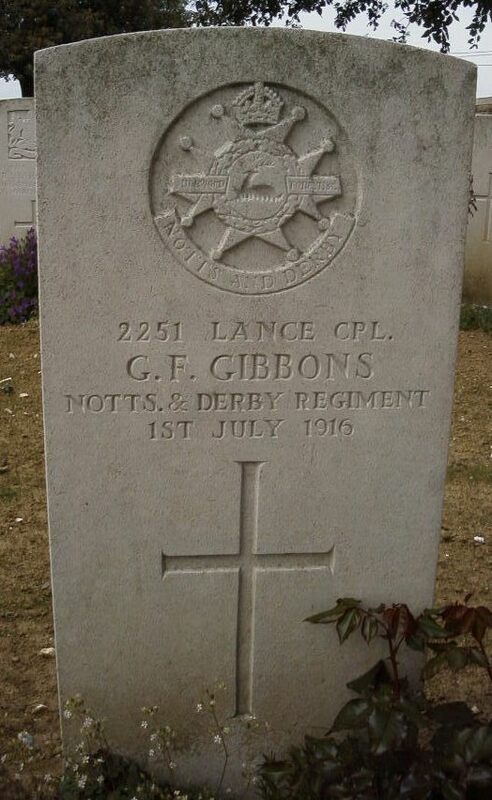 C Gibbons of the 5th Notts & Derby was identified by means of a cross, this was not subsequently verified and as such the man in Plot 2, Row G, Grave 5 remains unidentified. In fact it seems most likely that this was the remains of 2251/240490 George F Gibbons of the 1/6th Notts & Derby who is now buried in Plot 2, Row E, Grave 26. 4281 Pte. Thomas Sabine enlisted in April 1915 and arrived in France with the 7th Draft in March 1916. 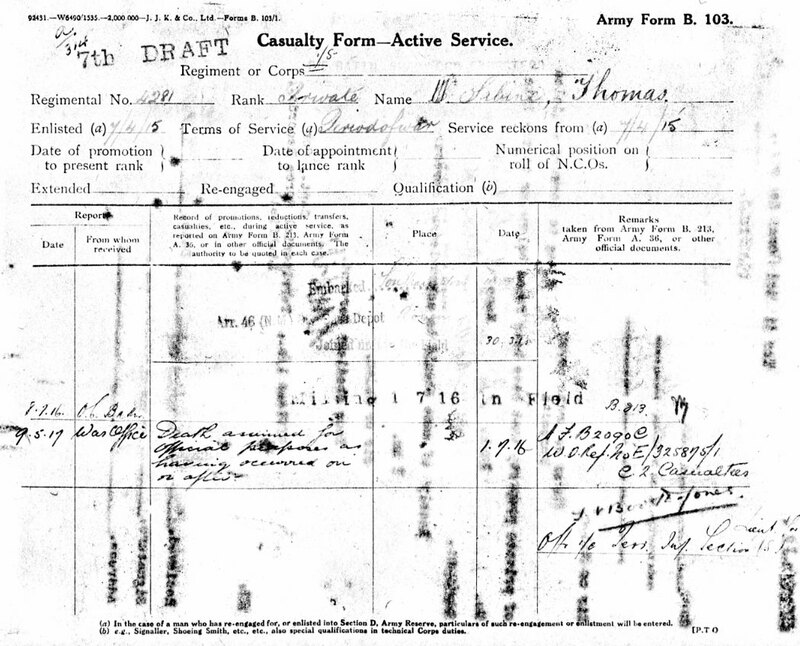 Thomas was originally posted missing, however, by 9th May 1917 his death was assumed for Official purposes to have occurred on or after the 1st July 1916. 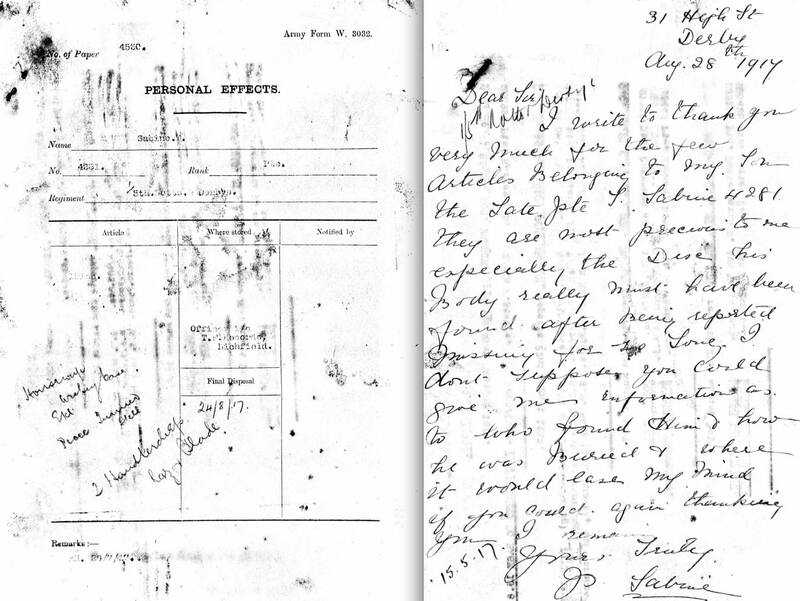 However, during August 1917 Thomas’ body was recovered from the battlefield and he was re-buried at 28.A.1.9. and a number of his processions were returned to his family in Derby. At the end of August Priscilla Sabine wrote to the War Office thanking them for the return of her son’s few belongings and asking for more information on who found the body and how he was buried. Plot 57. D. E. 28. A. 3. 0. 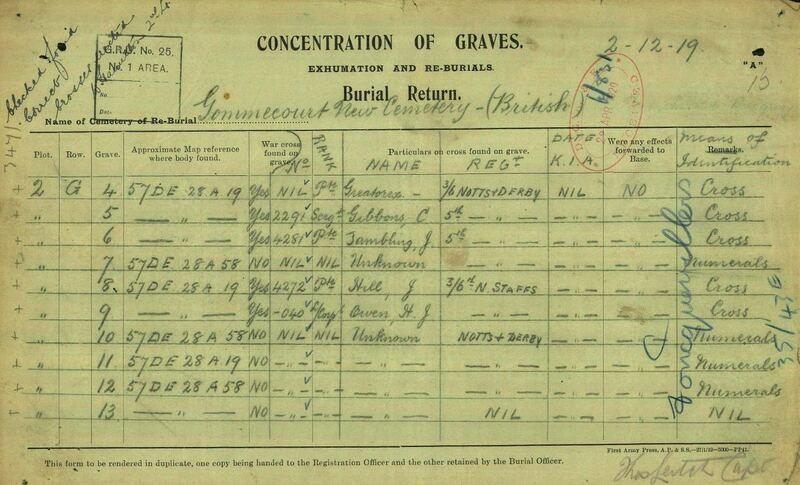 Un-numbered sheet of the Burial Registry for Gommecourt Wood New Cemetery dated 29th December 1919. The men are recorded as being buried in Plot 2, Row B, Graves 19 & 20 and Row E, Graves 21 to 30. The bodies of all 12 men were recovered from 28.A.3.0. and 7 of them are unknown; even though all of the graves still had crosses erected in 1919. This group of men are a mixture of 7th Notts & Derby and 6th North Staffs. 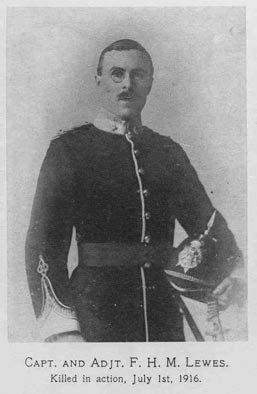 Captain John Masfen Stack of the 1/6th North Staffs. 266785 Pte. J Smith of the 1/7th Notts & Derby. 3411 Pte. Stanley Watkins of the 1/1th Monmouths. 2251 George Fletcher Gibbons of the 1/6th Notts & Derby. 266721 Pte. A Bilson of the 1/7th Notts & Derby. George Gibbons was originally posted as missing before being struck of the strength of the 1/6th Battalion on the 18th August 1916. However, on the 21st March 1917 his body was “buried in front of trenches between Fonquevillers and Gommecourt” by men of the 1/6th North Staffs. At this time no effects were returned to his family. Foncquevillers was in British hands in 1915 and 1916. On 1 July 1916 Gommecourt Wood was attacked by the 46th (North Midland) Division and the Southern part of the village by the 56th (London) Division. The attack met with temporary success, but could not be sustained; and Gommecourt remained a salient in the German line until 27 February 1917, when it was evacuated. It was never retaken by the Germans; at the end of their offensive of March 1918, it was just within the British lines. 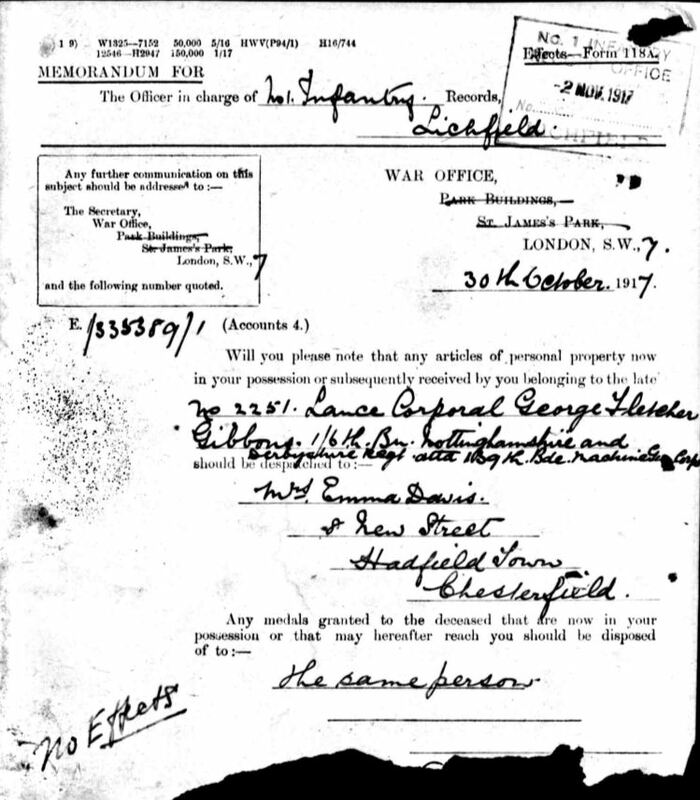 Gommecourt was later “adopted” by the County Borough of Wolverhampton. BASTION CEMETERY, FONCQUEVILLERS, in the old German line North of the Wood, where 55 men (nearly all unidentified) of the 46th Division were buried. BRETENCOURT FRENCH MILITARY CEMETERY, on the West side of the bridge between Bretencourt and Blamont Mill, in the commune of RIVIERE. Here were buried 233 French soldiers and 38 from the United Kingdom; three men of the Indian Labour Corps; and one German prisoner. GOMMECOURT CHATEAU CEMETERY, at the North-East corner of the Chateau park, begun by the Germans. Here were buried 55 soldiers from New Zealand, who fell in July and August, 1918, and 14 from the United Kingdom. GOMMECOURT WOOD CEMETERY No. 1, or THE SAP CEMETERY, FONCQUEVILLERS, between the old front lines, in which were buried 111 men of the 46th Division, almost all unidentified. GOMMECOURT WOOD CEMETERY No. 4, or LITTLE Z CEMETERY (from a strong point on the old German front line), FONCQUEVILLERS, which contained the graves of 22 men of the 46th Division and one other. GOMMECOURT WOOD CEMETERY No. 5, on the North-West side of the Wood, contained the graves of 27 men of the 46th Division. GOMMECOURT WOOD CEMETERY No. 6, close to No.5, contained the graves of 40 men, almost all of the 46th Division. GOMMECOURT WOOD CEMETERY No. 8, FONCQUEVILLERS, between the old front lines, contained the graves of 46 men of the 46th Division. POINT 75 BRITISH CEMETERY, FONCQUEVILLERS, on the old German front line, contained the graves of 35 men of the 46th Division.